HEARTT Animal Refuge is a no kill, all volunteer shelter. Your donations are tax exempt! HEARTT Animal Refuge is a 100% volunteer, No-Kill animal refuge and adoption center. We rescue abandoned and abused cats and dogs, provide them with a home and good medical care until they are adopted. We are strong supporters of neuter/spay. Our organization was founded in 2007. We have both state non profit and federal 501(c)(3) tax exempt status. Our mission is simple: Provide a safe, nurturing environment for cats and dogs until they are placed with permanent and loving forever families. We do not receive any local, state, or federal funding. 100% of our funds come from loving donations. You can help too! Chico on his way to his forever home. Sponsor a four-legged friend or give a sponsorship as a sweet gift! HEARTT’s Wags & Whiskers Spring Fling – Thanks for attending! 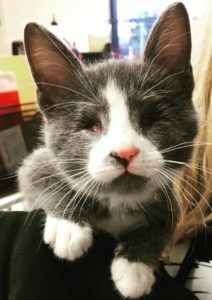 Stubbs is a Manx kitten born without eyes. Come along with Stubbs as he learns about his new surroundings at HEARTT Animal Refuge! YOUR GIFT CAN TRULY SAVE LIVES! You can sponsor a dog or a cat for as little as $10 per month ($120 for a year). Room and run sponsorships are also available. Remembering and honoring someone through a memorial donation will also help support our shelter. Click here for more details. We need dedicated, dependable, hard working volunteers who love cats and dogs and would like to make a difference in the lives of abandoned and abused animals. Come volunteer with us and have fun and eliminate stress from your life. Our shelter/adoption center is in Sharonville, Ohio. We are no-kill and 100% volunteer. Click here for more details. Join us at Wags & Whiskers! Copyright © 2019 Heartt Animal Refuge. All rights reserved.